One swallow doesn’t make a summer but a nestful does! When the parents of this brood of young swallows laid their eggs in a nest made on top of an old door in one of our outbuildings I didn’t think they had a chance of hatching. 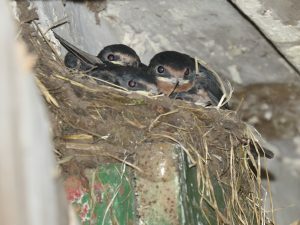 It was a place we use every day and each time we went in the female flew off and abandoned her eggs. There was only one solution – a massive tidy up and re-housing of anything we used regularly. 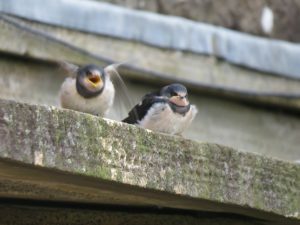 The plan worked and they have successfully fledged and are flying about with many other young swallows learning how to swoop and dive and catch their food on the wing.